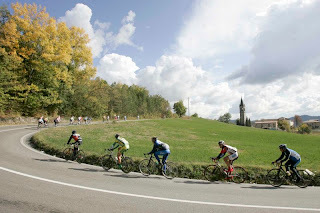 While I was out playing yesterday in the Granfondo Italia the pros were out battling for a victory in the final classics race here, the 2007 Giro di Lombardia. Verona local Damiano Cunego (Lampre-Fondital) won the 101st edition of the race in a two up sprint against Riccardo Riccò (Saunier Duval-Prodir). 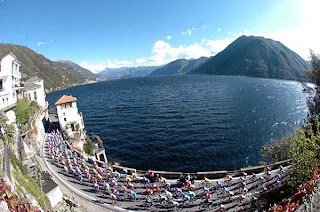 The race passes along beautiful Lake Como, has famous climbs such as the Madonna di Ghisallo, and finishes in the town of Como. Cunego rides a special, special edition Wilier. Wilier, a Veneto region bicycle manufacturer, created the "Cento" model for its 100th anniversary. Furthermore, they created a special Damiano Cunego Cento (which is sold at Wilier dealers). The frame is white with exposed carbon and is easily identified by its curved top tube and its headtube which has a flat front. In addition, the frame has small graphics portraying key events in Cunego's life. 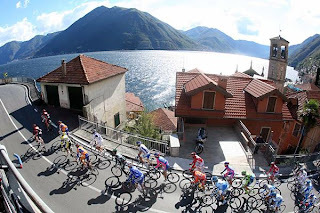 The Granfondo Italia is the last major granfondo of the cycling season. It's also limited to those that have competition licenses. With everyone having lots of Kms in their legs and the course being also relatively flat the result is an extremely fast, and at times, dangerous race. Today also featured very strong headwinds which created a lot of movement by riders as they sought protection from the wind. This is the second time I've entered and along the way I wondered once again if the risk is worth it. Until you reach the climb the pace is in the 40-45 Km range (25-28 mph). 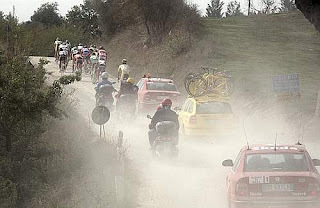 At the 18 km the roadway looked like a battlefield with about 10 riders down along both sides. At the 25 km mark there was a very serious, horrible, accident. These accidents are typically caused by touching wheels. With 2,500 riders that are unknown to you, and how well they can ride, it makes for a heart thumping experience. At 32 km the road went up and that stretched out riders pretty well, especially the pitch of 18%. This year I didn't cramp on the climb which I was grateful for. Normally, you would look forward to the descent starting at 52 km. However, the road is terrible. Rough, holes, narrow, and deep depressions. Imagine that with riders flying to your left and right. I was willing to sacrifice some places in order to arrive at the finish safely. Unlike the rider that I saw face plant on this stretch. That was bad. From 56 km to 95.5 it's a gradual downhill grade (1%?) and that might be normally enjoyable flying along in a large group but the wind today was so strong it felt like you were pedaling uphill all the way. All I can say is that I need a rest now. I am more mentally then physically tired. I have approximately 10,500 km/6,500 miles of riding in this year and there are still 2 months to go. From here on out I'll be relaxing a bit. It was also my last race on my Pinarello as I'll be retiring it as I move over the components to the Chesini "Innovation". Photos (by Enrico Lodi): the start in Carpi, passing Ferrari, the start of a climb, rough road on the descent, everyone receives a nice medal upon crossing the finish line. After the Giro of Lake Garda on Sunday on my Richard Sachs I was reminded again how wonderful a well made steel bike can ride. My every day bike is a Pinarello Marvel (aluminum with carbon fork and carbon seatstays) and while it has been a workhorse I can't say it brings a big smile to my face. So, I've decided to retire it. Besides, it's fun to do bike projects and have new experiences. Keeps things fresh. I did go bike shopping and would have liked to try a good carbon bike but with the euro/dollar conversion rates being in the toilet I decided to go another route. Some time ago I had found a rather interesting frame/fork built in approximately 1993. 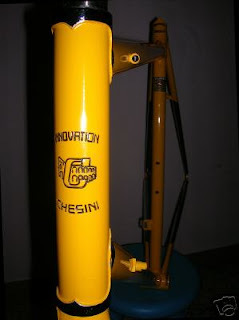 It's a Chesini "Innovation". I've previously written about Chesini here but to summarize it's the oldest bike shop in Verona. I also like having bikes that are a bit different and this meets that criteria. In fact, the design was patented ("brevetto") here in Italy. 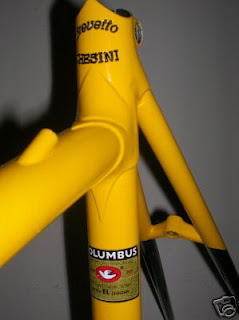 It's a sloping (in the current sense) steel frame, lugged, and built with Columbus EL-OS. For steel it's light. The headset is engraved with an image of the Roman coliseum of Verona and that appealed to me as well. I've decided to to mix new and old. The first step will be to have the frame painted, now a hideous yellow. I've given the frame to Chesini and that part of the process has begun. From my stash I'll be using an ITM Millennium all carbon fork to use with the frame to give it a modern look and save weight over the original heavy fork (which is also being painted but will be saved). I also have some other bits to save weight: Easton CT2 carbon seatpost, ITM Millennium Ultralight handlebars, Cinelli Ti stem (if the length is right). The Shimano components from the Pinarello will be moved over. I haven't decided on what to do with the wheels yet. I might moved the Malagnini's DuraAce wheels onto the Chesini. I think the project will be finished by the end of November. It was a good time to have started this project because as of right now I have a pretty good back pain from hitting the pavement on Tuesday. In order to avoid being hit by a car at a newly built roundabout I swerved into some find sand the construction crew left behind on the roadway. Tires lost traction and I did a pretty good slide. Two days later I started feeling the back pain. 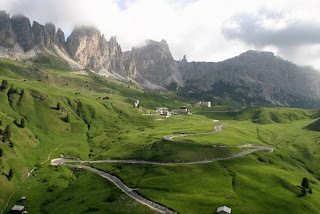 Tomorrow is the Granfondo Italia and I'm going to do it (unless it rains) and hopefully just get through it. Then I'll rest...with a nice vacation. I decided to put all of this into one entry from here on out. The world champion Paolo Bettini will play the star role at the Bicycle Show from the very first to the very last minute. He will arrive at Fiera Milano on the morning of Tuesday 6th November to take part in the opening ceremony of EICMA 2007 . On the 6th and 7th he will take part in the training sessions scheduled for all BIKES4SHOW participants on the track set up in pavilion 7. From Thursday 8th November, the day the Bicycle Show begins, he will contend the victory of the first edition of BIKES4SHOW, and will remain on the track until Sunday 11th November. He will team up with Marco Villa, the best Italian specialist in action who has given up the 6-day Monaco event to take part in the Milan Show. Bettini-Villa will be the two-man team to defeat, but it won’t be easy for them: Ballan-Pozzato, Baldato-Napolitano, Grillo-Ongarato, Popovych-Zagorodny, to mention only a few of the other teams taking part, are all truly remarkable competitors.BIKES4SHOW starts off in grand style. The 65th Bicycle Show of Milan could not have a more innovative and sensational enrichment than this. Milan Bike Show Press Pass Arrives! My press pass as ITALIAN CYCLING JOURNAL arrived today for the EICMA Milan Bike Show (actually named the 65th International Bicycle and Motorcycle Exhibition)! 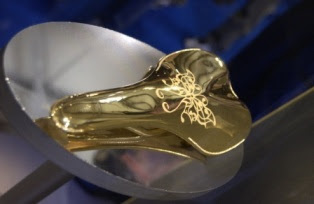 I am looking forward to seeing the new innovations that the Italian bike industry will be bringing to the exhibition, the odd and interesting tidbits, the famous personalities, and not-so-famous but nice persons that make the show fun. 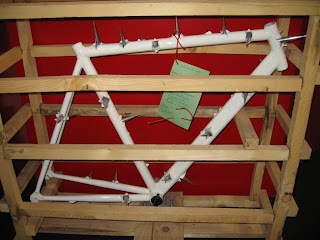 Photos from 2006: my favorite bike, a "punk" frame; 50,000 Euro gold saddle with diamonds that a sheik had made for his daughter; meeting Eddy Merckx was over the top! 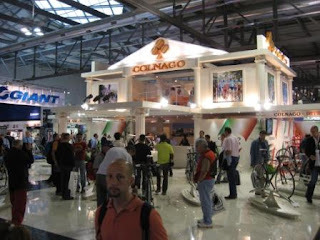 ; this is one of the not-so-famous persons that makes the show fun; the Colnago "booth" (did I say booth?!). It was with sadness that the cycling community learned of the death of 37 year old Luca Avesani, sponsor of the Granfondo Avesani here in Verona. He was killed in a tragic motorcycle accident. A passionate cyclist, and motorcyclist, Luca's family owns the well known Avesani brand of pasta products that are sold regionally and oversees. 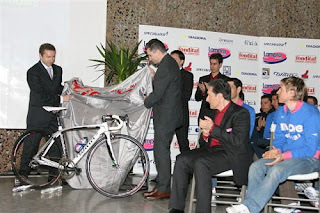 As director of the company he assumed the role of main sponsor for what had been formerly named the Granfondo Chesini. A communique from the organizers (below) announces that the next, and 10th, edition of the granfondo will be named the "Granfondo Luca Avesani" so that in this way he will be with us and in our hearts. Con immenso dolore comunichiamo che LUCA AVESANI è scomparso in un tragico incidente . E per onorare la sua memoria e ricordarlo in bici ancora con noi , d'accordo con la famiglia, dedicheremo la granfondo scaligera a LUCA . Pertanto la prossima edizione ( decima del nostro impegno organizzativo ) verrà denominata " GranFondo Luca Avesani" . Così Luca sarà ancora con noi e nei nostri cuori . - Thursday: from 11:00 a.m. to 1:00 p.m. and from 3:00 to 6:00 p.m.; - Friday: from 11:00 a.m. to 1:00 p.m., from 3:00 to 6:00 p.m., and from 8:00 to 10:00 in the evening (the show closes at 10:00 p.m.);- Saturday: same hours as on Friday (but the show closes at 6:30 p.m.);- Sunday: from 11:00 a.m. to 1:00 p.m. and from 3:00 to 6:00 in the afternoon. 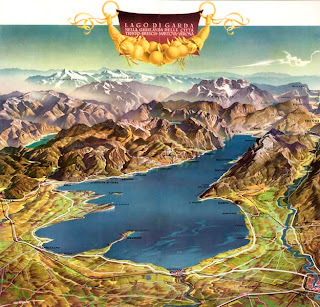 Sunday, October 14th, was the Giro di Lago di Garda with Eros Poli. For a variety of reasons I couldn't get a lift (we live without a car) to the starting point in Calmasino. I was up at 5:30 a.m. in order to have a calm breakfast and departed from the historic center of Verona at 6:30 a.m. It was so quiet and peaceful as the city was a couple of hours away from coming to life. The ride in darkness was uneventful and I arrived at the Hotel Veronello at 7:50 a.m. after an easy spin with, thankfully, the wind to my back. With a ride start at 8:30 a.m. I had time for an espresso and to say hello to some of the friends I've made on the France cycling trips. By 8:30 a.m. things were getting fairly chaotic. This ride in the Spring had 40 riders. Eros was expecting about 50 riders. 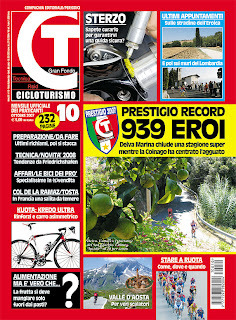 However, the "passaparola" (word of mouth) must have been working overtime as 106 riders showed up (including 5 women). That's a very large group for some narrow roads, and in particular, to go through the small tunnels on the west coast of the lake. Eros made announcements regarding ride conduct regarding no more than two riders abreast and maintaining absolute silence in the tunnels so you can listen for any problems as you can't see (whoa!!!). Having done the ride in the Spring I knew what to expect, and it is freaky in some of the tunnels as the lighting ranges from well lit to NO LIGHTING. We departed at 8:35 a.m. and rode into Lazise, and from there we started our clockwise ride around the lake. It was about 12 degrees C and very overcast; the weather forecast had called for partly sunny. I was glad I had a windbreaker on. When we reached Salo the roads were very wet but we had missed the rain. Riding at 40 km/h, 25 mph, on wet roads with a large group means it's time to be really paying attention. As we left Salo we had the first accident of the day. I'm not sure what happened but a gentleman went over the handlebars. His ride was finished, broken collarbone. As we started through a long series of tunnels at the northwest end of the lake the group became split into multiple smaller groups. I was in a middle group and we somehow missed the turnoff where there was going to be a panini (small sandwichs) break. So, with everyone that had been ahead of having turned off it put us at the front of the ride. As I said, some of the tunnels are very well lit, some are marginal, and there is one that has no lighting whatsoever. My personal strategy for dealing with the latter works like this: I slow up waiting for a car(s) to appear in the distance behind me. Then I time my approach to the tunnel so that I arrive in front of them. As I get to the entrance of the tunnel I move to the center and block them. Car must use their headlights so as they are forced to drive behind me they light the way. Crazy, right? Arriving at Riva di Garda, at the northern most point of the lake, we found that a few riders were actually ahead of us, and a few others pulled in behind us shortly. We filled up with water, a few of us had more espresso, and then we had a discussion whether to continue ahead or wait for the main group that was at the panini stop. The consensus was to continue at it was chilly and we didn't want to cool down. This group comprised about 20 riders. By time we started heading south along the eastern shore of the lake it was pretty evident that the guys at the front of the group were some kind of monster strong types driving hard into a strong headwind. Five of us fell back and we rode at our own pace which was pretty decent. Over the next 10-15 km we picked up riders that had been dropped one by one from the strong group in front. That brought our group to about 10 riders. We caught up with the strong group near Malcesine as they had been stopped and ticketed for not riding single file. So, we were 20 again and the pace was more manageable all the way to Lazise and back to the hotel. We arrived at 1:50 p.m. The main group, with Eros, arrived about 25 minutes later. Eros looked fairly stressed. No wonder. One of the women had crashed (possible broken collarbone) in one of the tunnels and several riders had been taken down. His group had also been stopped and ticketed through Malcesine for not riding single file. About 40 of us that had signed up for the after rider buffet at the Hotel Veronello enjoyed a very good late lunch, including Bardolino red and Custoza white wines, and some excellent deserts. A great way to finish the day. I was tired, more mentally than physically, from the day so I was very grateful when Eros offered to give me a ride home. 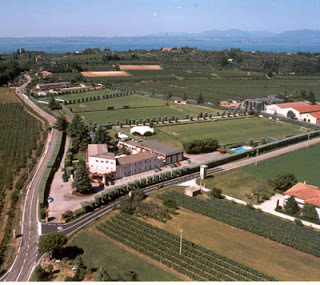 I thought I'd write in more detail about the towns on the shores of Lago di Garda (Lake Garda). Today was a gorgeous day and with a 180 km + ride planned two days from now I took the opportunity to do an easy ride to Lazise on my Malagnini bike. Lazise is located on the eastern shore of Lake Garda, about 25 km northwest of Verona, and is in the Province of Verona. Originally a group of stilt houses, Lazise was later occupied by the Scaligeri family of Verona during the 13th and 14th centuries. They encircled it with turrets and walls and built its castle. In 1405, Lazise came under Venetian rule until Napoleon conquered northern Italy. After the conference of Vienna (1815) it entered a period of Austrian rule, until 1866, when it became incorporated into the new Italian state. You can enter the medieval center of the town through three gates in the wall that surrounds the town. The town is also accessible by the lake ferry system (http://www.navigazionelaghi.it/). The center is car free and there are many small shops, restaurants and bars. Away from the lakeside promenade there are narrow alleys to explore. One aspect that also makes each lake side town unique is the design of its harbor. Lazise's enclosed harbor is very pretty, lined with colorful buildings and restaurants. The Romanesque San Nicolò Church is dedicated to the patron saint of sailors. Its frescoes, done in the 1300s, were painted by an anonymous artist of the school of Giotto. The latest news from the organizers is below. The event, which will be held on Sunday June 29, 2008, will open registration next week from October 18th until November 8th. Some 18,000 applications will be received and there will be 5,500 selected through a random drawing (additional spots are available through tours as noted below). The draw will be held on the 16th November 2007. Participants selected can then continue with the registration process.The complete list of participants drawn will be published at www.maratona.it a day after the draw. Full registration must be completed by April 18, 2008. - Open to all adult male and female riders. Minors over 15 (fifteen) and cyclists older than 65 (sixty five) may enter for the short distances (55 and 106 km). - The 2008 Marathon estimates a participation of 8,500 competitors, 5,500 entries by draw among all pre-registrations sent via the Internet, by fax or mail. - Participation fee is 70,00 € and includes 10,00 € for the guarantee deposit of the chip. RCS Sports, sponsor of the Giro d'Italia, hopes to make this race into a one day classic along the lines of Paris-Roubaix. The main sponsor is the Banca dei Monte Paschi which was founded in 1472, 20 years before Columbus discovered the new world. 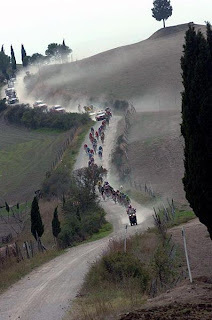 Today, Alexander Kolobnev of Team CSC conquered the first-ever running of the Monte Paschi Eroica, a 180-kilometre race composed of 'le strade bianche' (seven sections of 'white gravel roads' totalling 60 Km) around Siena, Italy. The 26 year-old Russian, silver medallist at the World Championships nine days prior, completed the last forty kilometres solo. Second was taken by his Swedish CSC team-mate, Marcus Ljungqvist, and third by Ukrainian Mikhaylo Khalilov (Ceramica Flaminia). Manuele Mori (Saunier Duval-Prodir) was the first Italian, in fourth. 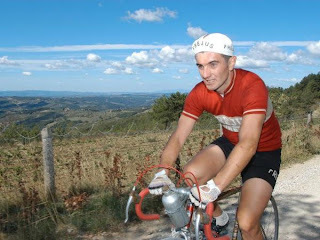 Two-time Giro d'Italia Champion Gilberto Simoni, who rode the cyclo-tourist version (L'Eroica) on Sunday, finished tenth. 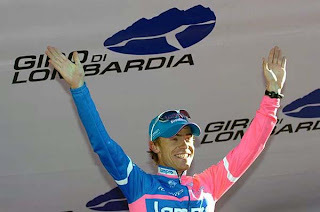 Noted Classics riders Filippo Pozzato (Liquigas) and Alessandro Ballan (Lampre-Fondital) finished with the main group. "It was a very particular race," said Kolobnev after the finish. "At the beginning of the day I did not think I could do something for the finale." The race went well for him when he made an escape of 11 men at kilometre 74. "It was good to be at the front in this race. I had made the selection, and then my solo move. Plus, having Marcus behind gave me confidence." His teammate attacked upon reaching the city limits of Siena, the city famous for its bi-annual horse races, Palio di Siena. "It is a great zone, with olive trees. Unfortunately, I could not see but 30 metres in front of me because of the dust." 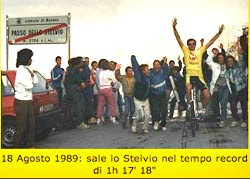 Paolo Bettini beat Kolobnev for the World Championship title, and although he was not racing he was in Siena to watch the racing. "It was a spectacular race to watch with all the dust." Andrea Tafi, the only Italian to win both Northern Classics Paris-Roubaix and Ronde van Vlaanderen, was also in Siena to watch the race unfold, and was happy with what the organizers had created. 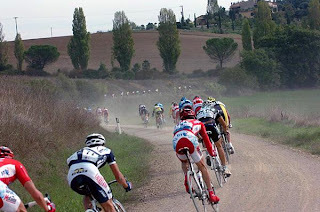 "Starting today Italy has its own Roubaix," said the retired cyclist to La Gazzetta dello Sport. "It was a spectacular show. 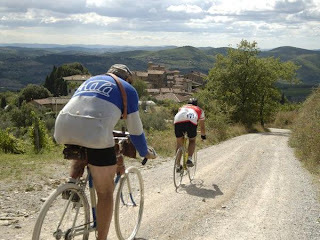 The Eroica has become a Classic. Let's mark a date, put it at the beginning of March, like our Het Volk, leading to the [Northern] Classics." 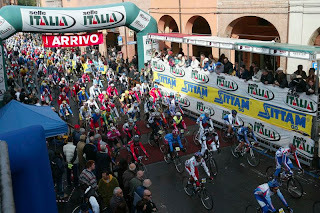 In total, 113 riders started the race and 42 made it to the historic Piazza del Campo. 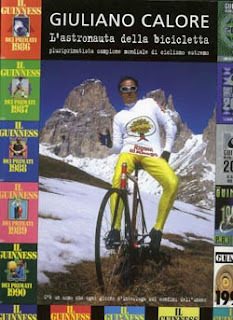 In between riding a lot I've been catching up on reading some of the many Italian cycling magazines. One I enjoy reading is "CT Cicloturismo" which is mainly dedicated granfondos, training for granfondos, technical reviews of bikes, and bike maintenance among other things. The October issue reported on the Friedrichshafen "Eurobike" show which was held in September. This show has replaced the Milan bike show as the largest in Europe. 34,280 visitors came to see the products of 868 exhibitors which were spread across 13 pavilions totalling 76,000 square meters. 3) the integrated seatpost (ISP) will be a "must"
Tomorrow is L'Eroica, an event that relives the heroic age of the "Giants of the Road". 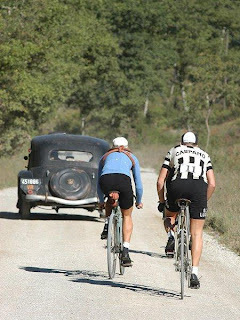 Participants ride on vintage racing bicycles and wearing the wool jerseys of bygone eras through some of the most beautiful roads of Chianti, Valdarbia and Valdorcia, with many sections of unpaved surfaces ("strade bianche", gravel & shale roads) which makes it possible to relive the atmosphere of "heroic" times of cycling. 2,200 entrants, from all over the world, are registered for this year's event. It's something I would like to do in the future but I need to find a decent vintage, really vintage, bike. If you cannot make the event it is possible to ride it at other times as the long and medium courses are now permanently marked. 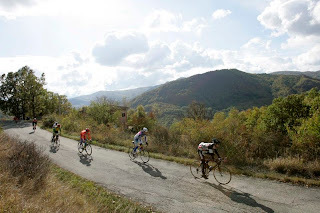 Also, the BluFreccia bicycling tour company, with the cooperation of L'Eroica Ciclismo d'Epoca, offers "Eroica all year long" with accommodations in hotels typical of the Chianti region. More details are available at http://www.blufreccia.com/. 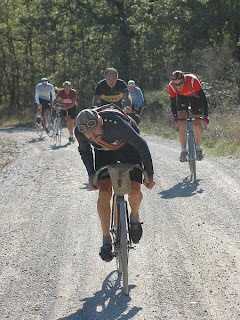 A professional race named the "Monte Paschi Eroica" will be raced for the first time on Tuesday, October 9th, after the 11 th edition of the L'Eroica. 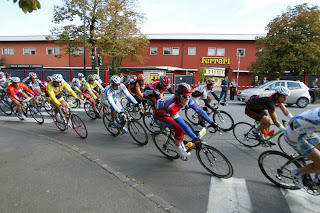 The race will be organized by RCS Sport, which also organizes Giro d'Italia and Tirreno-Adriatico among other races. RCS Sport has already confirmed modern champions like Danilo Di Luca, Het Volk winner Filippo Pozzato, Daniele Bennati, Flanders champion Alessandro Ballan and 2006 Roubaix king Fabian Cancellara. The organizers are also hoping to secure the participation of World Champion Paolo Bettini. Bennati was invited to take part in a special reconnaissance. "When they invited me to take part in this inspection I replied with enthusiasm," said Bennati, who lives in nearby Arezzo. 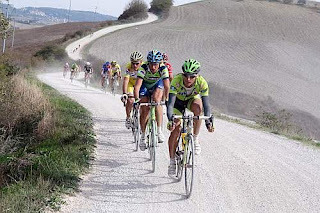 "These roads are used often when I train, even if I don't cover le strade bianche. "It was a sensation of turning back in time. I did not think that there still existed paths like these, where you only see a tractor every now and then," Bennati continued after his reconnaissance. "During the test I covered all seven sectors, and I can say that the last one contains points of 18%. You have to use a 39x25 (ed: that's a professional speaking! ), and you can't rise out of the saddle." The race will finish in the medieval Piazza del Campo, home of the famous horse races. "It will be an important race that could become an important Classic. ... I can already imagine the atmosphere of the arrival in the Piazza del Palio." My Gruppo 1 friends were chatting on Wednesday about Giuliano Calore from Padova. He's a rider that does some amazing things on a bike like: descending the Stelvio with no hands and riding up the Stelvio with no hands and using only one leg. 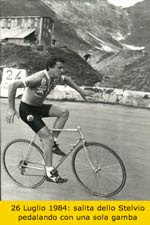 Lest you start laughing, the guy is no slouch: his 1985 descent of the 48 hairpins of the Stelvio Pass on a bike with no handlebars or brakes took just over 27 min., averaging 80 km/h; in 1989 he climbed the Stelvio on a bike without handlebars or brakes in 1 hour and 17 minutes.